Arlene Rodriguez was born 143 years after Daniel Shays died. But she feels like she knows the Pelham farmer whose name was permanently attached to the insurrection of 1786-87, which stirred fear in Gen. George Washington and gave strong impetus to the Constitutional Convention. Such familiarity was but one byproduct of a special project she co-organized last fall on Shays’ Rebellion, one important act of which was played out only a few hundred yards from the Springfield Armory. It was that landmark which, upon its closing, was converted into Springfield Technical Community College, where Rodriguez serves as dean of the School of Arts, Humanities, and Social Sciences. In that capacity, she has been involved in a number of other programs — from a partnership between STCC and the Community Music School to Rosa Parks Day events to organizing activities for Hispanic Heritage Month — that characterize both her community-minded spirit and her belief that learning takes place inside the classroom and out. And such learning mustn’t end with a college diploma, she told BusinessWest, adding that the Shays program, Reconsidering the Debt: Scholars Revisit Shays’ Rebellion, offered keen insight into the man who led the revolt and the so-called Regulators who fought beside him. Rodriguez taught courses ranging from English Composition to Latino Literature at the college for a number of years before becoming dean in 2005. 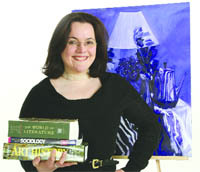 She credits deans she worked under with instilling an imaginative, outside-the-box approach to education and teaching. In her spare time, Rodriguez likes to read (she prefers history and fiction and is fond of the works of Japanese author Haruki Murakami) and write — she’s penned several short stories, most about her parents and life in their hometown of Aibonito, Puerto Rico. As for the story of her career and her involvement in the Greater Springfield community — there are obviously many chapters still left to write.